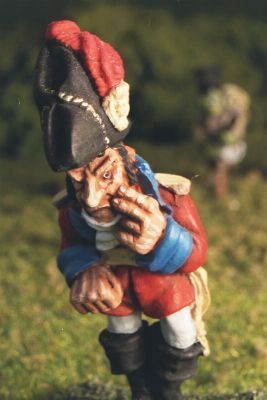 Flintloque, a game of Fantasy Napoleonics is published by Alector. The game pits "British" Orcs against "French" Elves. Other fantasy races make up the other major "European" powers during the Napoleonic Wars. "For damnation's sake, get out of my way Gibbonz!" Art-Tan, the Lord Wheeling-Turn, was not happy, his staff's wagons had been stolen away in the middle of the night, probably by some Catalucian guerrillas. It certainly didn't help to have that toe-rag Gibbonz in an effort to open a day nearly cause him to trip, He should have had him shot, but his Uncle was some cursed official to the royal court and thus if he shot Gibbonz, and even though he was the best General the orcs had ever had, he would be shot. Art-Tan watched as Gibbonz slunk away, bowing and scraping as he went; then a movement, it was that Sharke fellow. Art-Tan had raised Sharke (a half-elf) from the ranks to be an officer and a pretty good officer he was too (well in the fighting department, Sharke couldn't tell the difference between Claret and Port, so he could never be a proper officer). "Permission to speak, sir?" asked Sharke, somewhat breathless. "Enemy troops, over the ridge and on their way here, sir." "What troops might these be Sharke?" "Traitorous Bog-Orcs sir, thought they were our lads, but they're in Ferach uniforms, stunty Krauts with them too sir, oh and Ogres." Wheeling-Turn looked around, feet away were his new bodyguards, two Ogres of the Krautian Giant Legion, near the tavern was that Bog-Orc Sergeant of the Rifles. He looked back at Sharke and asked, "Anyone else Sharke?" "Yes sir, some elves as well." "Well we can't just run away can we Mister Sharke, get your boys organised and I'll let the staff know." Wheeling-Turn turned and walked to the group of nearby officers, he thought to himself, maybe that Gibbonz would do the decent thing and get himself killed. The Battle of Casa Tumoor was a small incident during the Catalucian campaign. Art-Tan, the Lord Wheeling-Turn with his staff were on their way to oversee the siege of the small fortified town of Dagajobz when staying one night in Casa Tumoor, their wagons were stolen by Dark Elf Guerrillas. Stuck in the town, surrounded by cases of Bakur rifles, assorted paperwork and other official stuff they were attacked by two small platoons of Ferach forces. The Lord Wheeling-Turn is General of all allied forces in Northern Catalucia and he's not a happy bunny. He is an Average Regular Orc (well in fact he is a Bog-Orc, but never say that to his face), he is armed with nothing but a map and a telescope. For Morale purposes he counts as Veteran. Colonel Bazun has recently purchased his commission and with contacts at the Royal Court has found himself in charge of Wheeling-Turn's bodyguard. He is a Raw Regular Orc armed with a large stick (count as spear +1 in hand-to-hand combat). Colonel Simmerzun, a creep really, somewhat of a coward, but again has friends at the Royal Court. He is a Raw Regular Orc armed with a sword and a pistol. Lieutenant Gibbonz, another creep, also a bit of a coward, but just so happens to be the nephew of the said Colonel Simmerzun. He is a Raw Regular Orc armed with a sword and a pistol. Corporal T-Arry of the Krautian Giant Legion (KGL), is one of two Ogres assigned as bodyguards to the Lord Wheeling-Turn. This is their first assignment. T'Arry is a Raw Regular Ogre, armed with a Double Musket. Corporal T-Army also of the Krautian Giant Legion, he is a Raw Regular Ogre, armed with a Kännonderbüss. Lieutenant Sharke, well what can be said for this hero of infamous number of battles. Sharke is an Experienced Elite Orc. He is armed with a sword and a Bakur Rifle. Sergeant Harpy, friend of Sharke, he's an Experienced Elite Bog-Orc. he carries his Seven Barrelled Volley Gun and one of the Rifles' Sword Bayonets. Private O'Sleaze is an Average Elite Bog-Orc, friend of Harpy and is armed with the Bakur Rifle and Sword Bayonet. Private 'Arris is an Raw Elite Orc, armed with the Bakur Rifle and Sword Bayonet. Private Smick is an Raw Elite Orc, armed with the Bakur Rifle and Sword Bayonet. Private Gunzun is an Raw Elite Orc, armed with the Bakur Rifle and Sword Bayonet. Trooper Smegzan of the 1st Life Guards, has temporarily lost his regiment, so has assigned himself to the General Staff until the 1st Life Guards turn up. He is (though you wouldn't believe it) an Experienced Elite Orc armed with a Carbine and Sword. Colonel El Jos is the Dark Elf liaison officer assigned to Lord Wheeling-Turn, he is wary of Wheeling-Turn (mainly as the last Dark Elf liaison officer was eaten after most of the General Staff got drunk one night). He is an Experienced Guerrilla Dark Elf, mounted and armed with a Carbine and a Lance. Sergeant Doyle is the leader of this section of the Guinelian Legion, he has a real hatred of all Albion Orcs for what they did to his homeland. He escaped to Ferach after assassinating a high ranking Albion Orc many years ago. He is an Experienced Regular Bog-Orc, armed with a musket and bayonet. Private Collins was Doyle's friend and helped to organise the escape to Ferach. He is an Average Regular Bog-Orc, armed with a musket and bayonet. Private Murphy was originally in the 18th Royal Guinelian Regiment of the forces of Albion, he deserted and joined the Ferach Guinelian Legion, not really out of choice but at least there were none of those snooty Albion Orcs in command. He is a Raw Regular Bog-Orc, armed with a musket and bayonet. Private O'Connell was born in Ferach of parents who escaped at about the same time as Doyle. He is a Raw Regular Bog-Orc, armed with a musket and bayonet. Private O'Malley is another deserter, he is a Raw Regular Bog-Orc, armed with a musket and bayonet. Private O'Donnell again another deserter, he is a Raw Regular Bog-Orc, armed with a musket and bayonet. Private O'Reilley is not sure where he came from, he seems to have spent his whole life in the army. He is a Raw Regular Bog-Orc, armed with a musket and bayonet. Attached to the Guinelian Legion are Elf officers and other troops, some who even claim to be (somewhat distantly) related to the Bog-Orcs of Guinalea. Corporal Detente, though in theory Doyle outranks him, he is actually in command of the section, but it makes life easier to have Bog-Orcs appear to be led by a Bog Orc. He is an Experienced Regular Elf, armed with a musket and bayonet. Private Croissant is not very happy being assigned to the Guinelian Legion, but that what comes of being caught out of barracks. He is an Average Regular Elf, armed with a musket and bayonet. Private Eclair is adamant that he has Bog-Orc blood in him (whether that's true is not known and to be honest not too many care). He is a Raw Regular Elf, armed with a musket and bayonet. Private O'Fromage has slightly Orcish features, he thinks that his Grandmother was taken by an Albion Orc many years ago. He is a Raw Regular Elf, armed with a musket and bayonet. 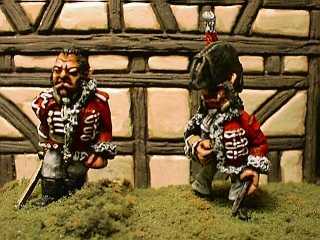 Sergeant Steiner leads this section comprising seven Finklesteinian Confederation Dwarfs and two Finklesteinian Confederation Ogres. He is a hardened soldier with years of fighting behind him. He is an Experienced Regular Dwarf armed with a Dwarf Musket (Mk 2) and bayonet. Corporal Heinz is another hardened soldier, though with somewhat of an attitude problem and has been promoted and demoted more times than he can remember. He was originally the sergeant of this section before, but after an incident involving a commanding officer, a chicken and a large wooden spoon was busted back down to private. He has managed to get promoted to Corporal. He is an Experienced Regular Dwarf armed with a Dwarf Musket (Mk 2) and bayonet. Private Schmitt is a very good soldier who likes army life. He is an Average Regular Dwarf armed with a Dwarf Musket (Mk 2) and bayonet. Private Dachschund does not like his nickname "Dog", but has learnt to live with it. He is an Average Regular Dwarf armed with a Dwarf Musket (Mk 2) and bayonet. Private Günter has just joined the regiment. He is a Raw Regular Dwarf armed with a Dwarf Musket (Mk 2) and bayonet. Private Sauerkraut is one fat dwarf. He is a Raw Regular Dwarf armed with a Dwarf Musket (Mk 2) and bayonet. Private Schultz is one mean street fighter, but hasn't quite caught the knack of fighting on the battlefield. He is a Raw Regular Dwarf armed with a Dwarf Musket (Mk 2) and bayonet. Trooper Mustog is a huge Ogre, and we mean huge. He is an Average Regular Ogre armed with the Kännonderbüss. Trooper Dobz is Mustog's brother and also on the large size. He is an Average Regular Ogre armed with a Double Musket. The orcs should be placed around the small village of Casa Tumoor, which consists of about four dwellings; you could add more buildings turning the conflict into a game of hide and seek with Wheeling-Turn hiding (and counting to one hundred). The approach to the village should have some elements of cover, but not lots, as you want to get some hand-to-hand fighting in and avoid a long drawn out shooting match. Around the village should be placed the baggage of the General Staff. At least one box should contain spare rifles, with cartridges) allowing for those troops whose rifles explode or jam. It takes one turn to search the box with a 25% chance of finding a loaded weapon (well orcs were never too careful about loading the stuff). It should be noted that all the officers (with the exception of Sharke) would not be seen dead with a weapon such as a rifle, an officer's weapon is his sword. To add a bit of spice, you can set the battle with all the orcs' weapons unloaded, except two of the Rifles who are on piquet duty, this gives the Ferach troops a chance to rush the orcs. The models used were from the Alternative Armies' Flintloque range produced by Crescent City Industries. Sharke and the Rifles came from the original boxed set of rules, whilst a large proportion of the Orcish General Staff came from the Sharke's Victory boxed set. The rest of the forces of Albion and the Ferach forces were from normal blister packs. 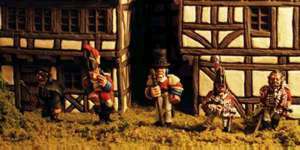 The buildings used in the battle were from Steve Barber Models, and though somewhat Germanic looking are entirely suitable for Flintloque (remember this is fantasy). Now Steve does do a wonderful range of 15mm Spanish houses and churches, now if he could produce these in 25mm, I would be very happy to buy some. The enemy approached, the Orc Rifles were in position, the staff gathered around Wheeling-Turn, ready with sword to protect him. The Orc Rifles moved out from the village to meet their foe. Private Smick fired first in an attempt to warn the enemy that they should come no closer, but closer they came. As the enemy marched closer, the rest of the Rifles fired their weapons, causing some wounds and one of the Finklesteinian Ogres to run like hell to the rear lines, this boosted the confidence of the forces of Albion, as Ogres were big and nasty. The return fire of the Finklesteinian troops caused some minor injuries. The Rifles retreated back behind their lines to reload and meet their enemy with their sword bayonets if necessary. The enemy troops marched slowly on the orcs, the first rank would fire, the second rank would step through and fire, as the previous rank reloaded. This continuous fusillade of volley fire tore into the orcs, wounding Sergeant Harpy, Private Smick and the Ogres of the KGL. The orcs desperately tried to reload their Bakur rifles, though deadly accurate were a damn slight more awkward to reload. Once more the enemy forces opened fire, though now the orcs let rip with the deadly accurate rifle fire, causing gaps in the enemy lines. With the bullets flying, Sharke yelled out his infamous battle cry and charged the enemy troops; with him went the Rifles and the two cavalry officers. The Guinelian Legion fought valiantly, for Ferach traitorous Bog-Orcs that is. The Guinelian Legion Sergeant a huge Bog-Orc struggled in combat with T-Arry, one of the KGL Ogres. However as Private O'Sleaze went down and Sergeant Harpy was lying on the ground covered in blood, the sheer weight of enemy troops broke through the lines and headed towards the Lord Wheeling-Turn. The officers surrounding Wheeling-Turn drew their swords and through themselves at the enemy. The scuffle of hand-to-hand combat is never a pretty sight, however the strength and skill of the orcs and their allies managed to win the day. Eleven enemy troops, over half of the opposing force had been killed. Wheeling-Turn assessed his uniform, that Dwarf blood would cause a very unsightly stain, he looked up, there was Sharke, standing there; his uniform was in a real mess, blood, black powder stains, a rip here a hole there. "Just a flesh wound sir, nothing to worry about." "Gave those Bog-Orcs and Dwarfs a damn good thrashing, did we not, Sharke?" "I say Sharke, do you have a spare uniform with you, the battle was quite messy was it not?" "Do say so sir myself, so I have changed into my spare uniform already sir."